I have been doing some of these poses for over 30 years. Before there was a yoga mat, there was a beach towel, or a braided rug. Sometimes just an empty courtyard in between teaching classes. But always there was a space to breathe, to be present. Often in these practice spaces words come back to me that our teacher would say to us at the beginning of class or during a pose. One of those sets of words I’ve always loved is “spread your feet like stars.” Anything that has to do with stars captivates me and always has, but back in my early 30’s when my teacher Judy would say this to us, it sounded so fanciful and strange that I would nearly laugh out loud. Being the literal woman that I am, I could see how my spread hands looked like stars, which she also asked us to do. 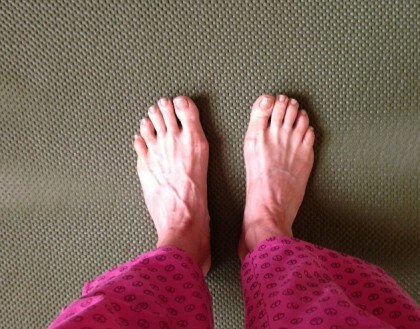 I couldn’t see how in the world I could ever spread my toes as if they were the points of a star. Because of the cerebral palsy I cannot spread the toes on my right foot at all. Instead they want to curl in all the time. I thought my attempts would always be incomplete. I focused sharply–and often painfully– on what I couldn’t do. It wasn’t until later on in my life, after the diagnosis of MS, and during my time in integrative manual therapy, that I came to learn how the body will respond to the thought of walking as if it is actually walking. These ideas and the experiences that came with them were new and life-changing for me. The patterns in which the CP had locked me and my thinking about myself began to soften and to transform. Always smaller than my left one, my right foot mysteriously “grew” half a size larger. It’s still smaller than my left one, but it definitely showed us it had some capacity to loosen the spasticity I had not known was possible. My manual therapist helped me continue to be able to walk at all by teaching me to palpate the feeling of the gait pattern in my hips, which I could instigate lying still with my hands on my hips, simply thinking of walking. My mind began to see my body reflected back to it in a whole new way, and a healing conversation between the two of them started to take place. I learned, too, certain other movements that would move the stuck lymph along–simple things like running my fingers over the knuckles in my hand, or the joints in my foot, or even along the ribs. All of these things eased waking up stiff, and helped keep me on my feet. As much as my imagination was captured so long ago by my teacher’s cheerful admonition to “spread your feet like stars,” I continued to conceive of it as metaphor for something I simply couldn’t do. It wasn’t until my friend Clark, who teaches yoga, shared with me that’s also called yogi feet or yogi toes, that I began to play with the possibility again. And that his teacher would also say to pull the corners of your mouth back toward your ears–that is, to smile, as you went deeper into a pose. Of course this made me smile. And when I returned to a daily practice, I decided when I began to struggle or worry or tense up in a pose, that I would direct myself toward all of these fanciful and silly directions. I would do my best to spread my feet (and fingers) like stars, and I would pull the corners of my mouth back toward my ears. It doesn’t seem to matter if I can actually spread all ten of my toes. What matters is that I think of it. And as I think of it, my body does it to the best of its ability. And as I do it, those corners of my mouth curl back toward my ears. And as that happens, the path between the chakras opens up and that wonderful energy yogis call the kundalini actually relaxes me deeper into each pose. And what’s most important, simply opening, or thinking of opening those extremities, opens my chest and my heart chakra, and my attempts at stretching literally become a heartfelt joy. With a body that wants to tip the scales toward stiffness and spasticity, this formula is like a magic incantation. I stretch beyond where I could ever stretch if I were simply trying to stretch or straining to stretch–something we are definitely not supposed to do when practicing yoga, but which nearly everyone does do. Spreading my feet like stars–and letting myself believe such an impossibility is somehow possible–has made me conscious of how many years I have spent struggling, trying and straining, either thinking this was the best I could do, or not even knowing that’s what I was doing. I am not fancy or particularly crisp in my execution of the simple poses I have done for years. But when I practice this “spreading,” I feel the intricacies of these simple poses in depths I did not ever expect were even there. I think spreading one’s feet like stars can be accomplished any time we start to harden up. If you can spread the toes on both your feet like stars, go for it. And if you can’t, then think of it, and let your body do the best it can do, along with that thought. And if you’re not into yoga, at least remember to pull both corners of your mouth back toward your ears when you start to stiffen up physically or otherwise. It’s like riding a magic carpet, letting your heart out of a cage. Apparently my time on the mat this morning was showing me I still focus too sharply on what I can’t–or think I can’t–do. So much so that I might miss the fact that I actually am doing it. That it is, as the motto I try to live by reminds me over and over, better than it was. And so it is that time travel on my yoga-mat-turned-magic-carpet inevitably leads me back to consciousness in the present moment–to wake up, and to be in that moment and nowhere else. It’s more intoxicating than smelling the coffee, as that saying goes. Maybe it’s true that practice makes perfect, I don’t know. But I do know that too much emphasis on the “perfect” part makes me lose sight of the gift of the practice, right here, right now. And if I do pay attention in the moment of my practice, I might–just might–get a glimpse of my feet turned to stars. what beautiful toes, spread like stars! Thank you for your words (and for sharing your feet) – such gift to me today. Profoundly moving. Beautifully written. Thank you. ANd thank YOU, Ruthanne, for these kind words. You’re welcome, Pam. I am honored. You have a wonderful way of thinking about things, Maria. You help me think better about things. Just like with this post – I get frustrated with myself a lot, with what I can’t do, with how long a way I have to go to get to whatever it is I’m aiming for… And I should just stop and be ok with it right now, and imagine myself there. The mind is indeed a powerful tool in making us who we want to be. Thank you for that reminder. I loved this sharing — I could relate. I have a fused hip from a car accident in 1976 — (crushed hip and pelvis). I was in traction for 3 1/2 months. I still have that injured hip – haven’t opted for any intervention surgically. I have always stayed active but of course my mobility is not the same on my left side as it is on the right. I practice yoga with a teacher once a week — and I have been at times very self critical that I cannot do what she tells me to try. However I have been practicing releasing all of that limited thinking and am doing much better most of the time. Your insights really encouraged me – you are a healer – thank you. Thank you Donna, I am so moved and honored by all you share here. Really appreciate it. Namaste. I love this post, Maria. I think it captures so well what the real magic of yoga is for all of us who are devoted to it — an experience in which we are invited to defy the boundaries and limitations we’ve attached to ourselves. I’ve had similar moments of sheer surprise at realizing (usually halfway through a pose) that I’ve done something I had many times declared impossible for myself. Thank you for sharing your experience, as always. I wish you could share this story with every person who has spasticity. As a rehabilitation physician who helps care for patients with various types of brain and spinal cord injury and disease, I have often used stretching and sometimes medication to address spasticity, but too often we don’t take advantage of the mind-body connection. Your experience shows another way one’s mind can powerfully enhance or perhaps in some cases replace other approaches. Where can I learn more about integrative manual therapy? Finally, thank you for sharing your beautifully written post. You have inspired me (without inducing guilt) to try to pull both corners of my mouth back toward my ears inspiring post more often — and maybe to return to my prior (fledgling) yoga practice. Dear PGYx, thank you for taking the time to make this amazing comment. I am so honored that this resonates for you in your work with patients who experience spasticity. The mind/body aspect of self-care is essential to my well being. I am slowly beginning to work on collecting, adding to and revising these blog posts to become a memoir that people with such challenges can draw encouragement from. You can read about Integrative Manual Therapy here: http://www.imtassociation.org/content/what-integrative-manual-therapy. There are also similar approaches that are direct or indirect offshoots of this one. Last of all, I am so pleased you find my post beautifully written and especially happy you will try to pull the corners of your mouth back toward your ears. 🙂 All best in returning to your fledgling yoga practice too.